If you come here for the recipes, this post might not be interesting to you. I promise, it’s a once a month thing! This post also contains a number of affiliate links. 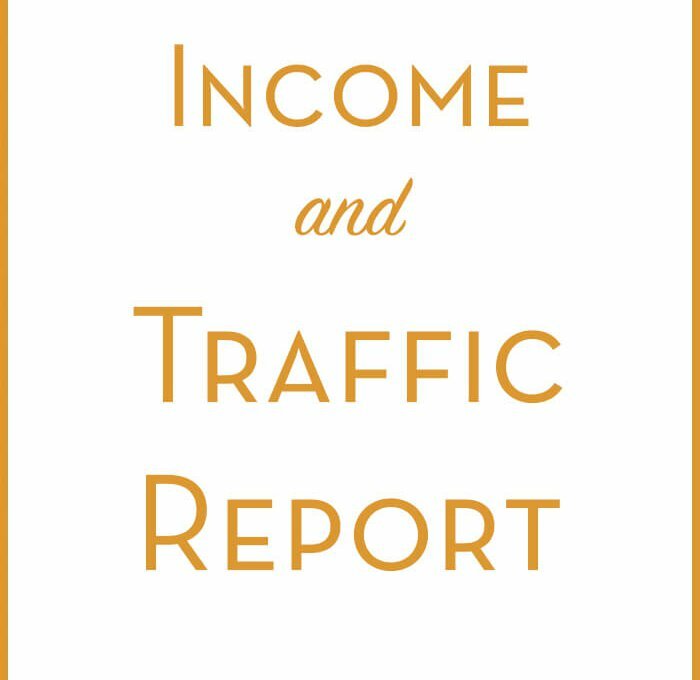 This is the first month I will be publicizing my blogging income and traffic report. You might be wondering why I am doing this. I was inspired by the awesome folks over at Pinch of Yum. Lindsay and Bjork have done an amazing job of growing their blog over the years. Instead of hoarding their secrets, they have generously shared their experiences. They are so dedicated to helping food bloggers that they created Food Blogger Pro. Food Blogger Pro saved me a lot of time when I was first setting up my blog. I learned how to make my blog SEO friendly and how to drive traffic to my blog. I even learned how to take better food pictures. If you are just starting out as a blogger, I highly recommend you join the community over there. It’s a very valuable resource. Due to Lindsay and Bjork’s transparency, I was able to visualize a future with blogging as a primary source of income. It’s not something that happens overnight. Pinch of Yum was already clocking in about 50,000 page views a month when they started monetizing. I’m nowhere near that, but my traffic is growing steadily. Although I am treating The Blenderist as a business; I’ve learned that the way to make a living as a blogger is to make great content. Content is the focus here. During the first 6 months, I focused on creating quality posts. 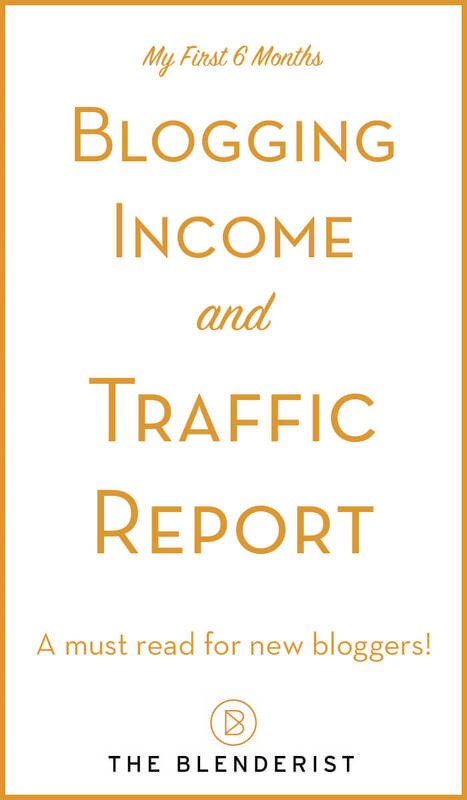 I spend a lot of time analyzing my traffic to figure out what my readers want. I’ve learned that my readers love raw vegan foods and low-carb desserts. Those terms come up frequently in my search results. I’m currently working on a couple of product ideas that I plan to offer for sale on the site. One is an e-cookbook, the other is a product for food bloggers. When those go live, I’m hoping to see a boost in income. Until then, the only income I’ve brought in so far is from ad networks and affiliate sales. If you are looking for information on how to make money from a food blog, I recommend the book “How to Monetize your Food Blog” . It’s got a lot of useful, step-by-step information on how to set up your ad networks. This first report will show my income and expenses for my first 6 months of blogging. I will be doing monthly reports going forward. The spike in April is due to a feature on the Redbook site and a post on Finding Vegan. In August, I had a recipe featured on Mashable and Finding Vegan; that really boosted my traffic. First of all, this report includes all my start-up expenses. I’m not including food costs at this time because I am currently making recipes with food from my personal groceries. I will eventually start including food and tableware in the expenses. This number is not a surprise to me at all. When you start a blog, you need to spend a little money to get things set up professionally. I decided to save some time by purchasing an excellent wordpress theme called Foodie. Once I purchased the theme and the Genesis framework , I customized it with a logo and header designed by Chris, my partner at RXVP. One thing to note is that my income from Gourmet Ads only represents a couple of days of traffic. I installed Gourmet Ads on August 28th. I anticipate a larger payout from them in the months to come. I’m pretty pleased to see that my organic traffic is high. People are finding me through Google and other search engines. Hooray! 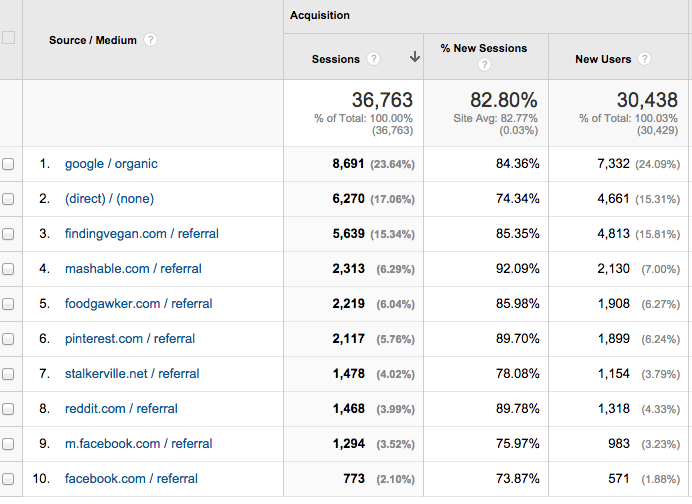 My top referrers, with the exception of Mashable are photo sharing sites. I post photos on those sites and people follow the links to see the recipe. I truly believe the first 6 months are the hardest. There is a lot to learn and it’s easy to get discouraged. I was lucky to find a community of bloggers willing to help and advise me. It takes time to accumulate enough content to make your blog “sticky”. Keep writing! I was fortunate to get some validation in the form of press from a couple of bigger media outlets that motivated me to continue. I have never sent an email to a writer or company asking for publicity. I will definitely be proactive about contacting the press in the future, but I know I need more content before I am aggressive about this. The feedback I receive from readers on Instagram, Facebook and Pinterest really keeps me going. I promised myself I would only blog if it was fun for me. There are times when I don’t feel like writing a post or photographing a meal, but overall I love the challenge. It has given me an opportunity to learn some new skills (food photography, wordpress customization) and practice some old ones (writing, cooking). The challenge will be to make the blog sustainable (generating income) without sacrificing user experience. For that reason, I would love it if my readers messaged me if they ever found an advertisement annoying or inappropriate. If you have any questions or comments, I’d love to hear them below! That’s awesome to go through your first 6 month experience.You are heading in a righ direction I would say with a clean and possible strategy. Also the thought of blogging without losing the fun part is very important to deliver a clean and useful content for the users. Please concentrate on piterest as it can generate a good amount of traffic. Good luck to you! Thank you for your comments! I’ve heard that people from Canada and New Zealand have an easier time getting accepted to Gourmet Ads. I am Canadian, so that might have something to do with it. I’m sure they have Canadian advertisers who want to see more Canadian blogs. Thanks so much for sharing!! You are doing really well. I have been blogging for 5 years now and I learnt a few things from this post. Thank you for reading! The learning never stops, does it? Thank you for this post. My blog is 3 1/2 months old and it was really helpful to see your stats. It is hard to put in the work when you are not sure if you are on track to get noticed. My main motivation is to help people eat healthier, but it would be nice to be able to pay myself back for the expenses of blogging. Your blog looks great! I definitely need more veggies in my life! I think there can be a balance between helping others and being compensated for the work and content we generate as creators! I really find your information so encouraging. Last night, I found a blog that started only four months before mine and already had thousands of followers on her social media and getting buckets of traffic. I started to feel inadequate because I am no where near that. It is nice to see others who have been around as long as I have and have stats around the same as mine! Have you applied to other publishing networks like glam, federated media, or blogher yet? That is why I thought it was important to share. I think we can learn from bloggers at all levels. Of course, I’m envious of people with oodles of followers and traffic, but I know I can get there if I stick to it! I applied to Blogher, but it was too soon. I will probably reapply in a few months. Hi Jasmine. I’m really loving your blog. This post about how you’ve started up is also really interesting to see! I’ve also liked you on pinterest 😉 If you have time, please check out my blog, . I’d love to have some feedback from you! Clearly, I still am learning html! 🙂 My blog is the Worktop. Thanks! Hi Tina, thank you for the compliments on my blog! I just followed you on pinterest and I’m going to take a look at your blog in depth over the weekend! I like what I see so far, the presentation is clean and modern! Thanks for sharing your stats! I’ve been blogging for six months as well but only ever read stats from bloggers who have hundreds of thousands of view a month. I’m from BC too 🙂 though on the other side. Hello to my fellow British Columbian! I’m going to have to give your blog a thorough read. I see a lot of recipe titles that appeal to me! I love the idea of posting your income. I just started my site in May and made it public a few months, but I haven’t even started trying to make money off of it yet. (Honestly, I didn’t even know it was possible until a few weeks ago. I started it as a cool summer side-project.) Maybe we can collaborate. My focus is on trying to make food science accessible to the average cook and using science practically. Kind of like Alton Brown, but more chemistry and physics focused. That sounds like a great idea for a blog. I love the food science side of things. I might have a collaboration idea that requires a little scientific knowledge. I’ll be sure to contact you when I get the idea locked down! It would be a mega-tutorial post. Sounds good to me. I’ll see what I can do. This is my site: darkchocolatealchemist.com. I think I mega tutorial could be cool! But depending on what it is, it might take me a while to do because of school obligations. Great job so far, Jasmine! I noticed you’re getting a lot of traffic from reddit. I’ve been told I should utilize that, but have no idea where to be active. Seems like a lot of the food subreddits are really slow or inactive. Do you have any suggestions? Hi Jessica, I do really well in the niche diet subreddits…vegan recipes, gluten-free recipes, paleo. Even though my blog isn’t dedicated to any one diet, I can usually find a good recipe for those with dietary restrictions. Hey Jasmine, this is awesome! Your traffic is impressive for how early you are, (especially your traffic coming from Google), consider me jealous! My wife is a blogger Tomato Boots and I write growth reports for her at http://www.tomatoboots.co/category/how-to-grow-a-food-blog/. We’re only three months in, you’ve definitely had a quicker start than us! Regarding Pinterest, you’ve got LOTS of room to grow there. 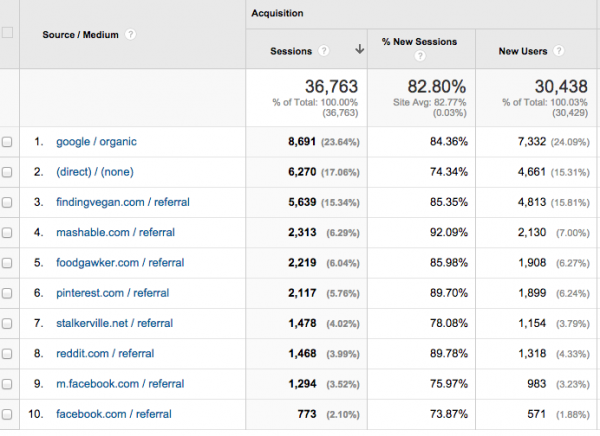 In July we were pretty inactive and only saw three referrals from Pinterest. In August we were invited to a handful of group boards and decided to spend more time there and had almost 900 referrals. Crazy difference. This is probably obvious, but I just posted a little tutorial covering the basics of group boards here: http://www.tomatoboots.co/pinterest-group-boards/. Nothing too complex in there but some of our learnings from the last month or two. One question for you, how did you get featured on Mashable?! You said you haven’t reached out, did you just see an increase and traffic and then found the article? Or did they reach out? So curious as to how that stuff happens, congrats on your early PR success! Thank you for your comment. I just glanced at your group board tutorial and I can see that there is some valuable information in there. After I write this comment, I’m going to go read it in full! I am on a Pinterest rampage right now, so anything pinterest related is of great interest to me! A writer from Mashable messaged me about the recipe and asked if she could include me in a round up. That was the same situation with Redbook. I should have asked where they found me, but it was probably Reddit, Pinterest or Twitter. Great article, I just moved my blog from blogspot last month and I’m trying to build up traffic as well. I’m getting around 4000 visitors monthly now, it’s a slow process, slower than I thought, but hopefully I’ll get there. I’ll keep reading your posts, good luck with your journey. The blog looks great! Thank you Oana, I wish you the best with your growth! Thank you so much for sharing this information! My blog is not food-related (you reviewed it and gave me pointers on Food Blogger Pro, thank you!) but this kind of info is so helpful and inspiring. It’s always good to be reminded to keep on truckin’ and working hard. 🙂 I look forward to following your progress in the future! Great article from a fellow FBP who has only been blogging for three months! Good luck on continued growth and your site looks fantastic! Thanks Glenda! I love FBP! here’s Jasmin 🙂 I’ve just found your blog and luckily read this article. I have been blogging for a while, but still haven’t monetized my blog, I’m happy with the creative (and learning) part of this work for now. And you put the whole business part of food blogging into perspective, so I’ll be following your further writing for sure. I’m glad you found me! It’s comments like yours that motivate me to continue sharing. 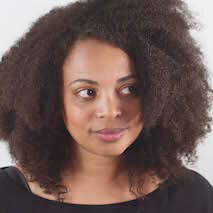 My name is Emily Jetland and I have been reading a lot of your information on FBP and I absolutely love your blog! You are definitely an inspiration. Thank you for the motivation to just keep writing and creating content. I just launched my blog — http://www.asweetandsweatylife.com/ and I have been absolutely loving the whole blogging thing! keep up the awesome work! Thanks Emily! Congratulations on launching your blog, it’s a lot of fun and a lot of work…but so rewarding! I love your determination and ability to share your growth patterns! I am a new blogger, just started this week and am motivated by the 800 views I’ve had so far, I hope to one day be a successful blogger like you 🙂 It’s funny how the few cents that I see growing on google adsense motivate me. Thank you! I still feel like I’m a huge work in progress…but I’m happy with where I am so far. Best of luck with you blog!